NEW YORK CITY — President Barack Obama and Republican Mitt Romney will go head-to-head tonight in their first televised debate of the season, and it's expected to be a doozy filled with zingers, one-liners and do-or-die attacks. 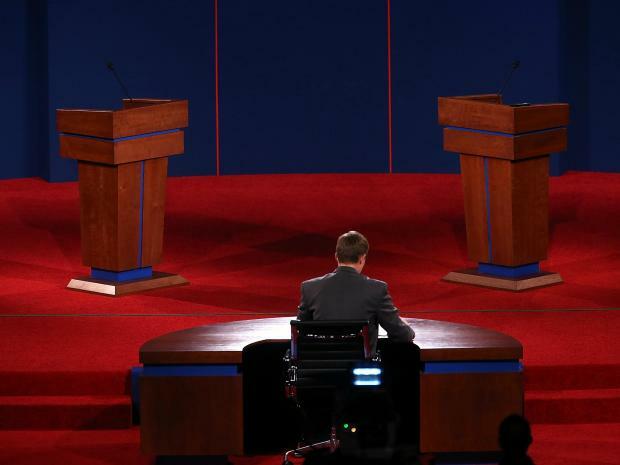 The debate kicks of at 9 p.m. — but that doesn't have to mean a night at home in front of the TV. DNAinfo.com New York has a guide to the best watch parties across the city where you can geek out — and get your drink on. Drinking Liberally will be taking over the Village Pourhouse with “politics, ideas and a liberal libation." In addition to a private bar and multiple TVs with sound for your viewing pleasure, you'll find drink specials including half-priced pitchers and two-for-one Vision Vodka cocktails. 64 Third Ave. (at Eleventh Street). Head to the back. 7:30 p.m.
Get the chance to smack down some pins before Obama and Romney start taking shots at each other at Lucky Strike Manhattan. The unique "Bowling for Barack" watch party will feature DJ D-Nice, Hot 97's Angie Martinez and local pols, including Assemblyman Hakeem Jeffries. 626-640 W. 42nd St. (at Twelfth Avenue). Doors open at 6pm. Bowling stops when the debate begins at 9 p.m. Tickets start at $25, with all proceeds going to Obama for America. RSVP here. If the bar scene isn’t quite your thing, reserve a ticket now for the 92Y Tribeca's debate watch party, featuring a pre-debate conversation and blow-by-blow commentary from Daily Show co-creator and former head writer Lizz Winstead, MSNBC's Krystal Ball and Richard Wolffe, comedian and former Onion digital director Baratunde Thurston, and Mystery Science Theater 3000’s Frank Conniff. 200 Hudson Street. Tickets are $10, available here. Head upstairs at sportsbar Smithfield NYC for the DL21C’s first debate watch party of the season. Organizers promise multiple big screens broadcasting the debate from numerous channels, as well as "special guests" and a makeshift “spin room” before and after the debate. Also on the menu: classic pub fare and craft beers. 215 W. 28th St. (at the corner of Seventh Avenue). 8 p.m.
Head up to Corner Social for HARLEM4OBAMA’s first debate watch party of the season. “Wear your gear and bring your enthusiasm,” organizers advise. 321 Lenox Ave. at 126th Street. 8:30 p.m.
Sports haven Blondie's Sports Bar and Restaurant will be trading its hockey and football for politics Wednesday night at a watch party hosted by the Community Free Democrats. Still on the menu: Blondie's killer wings. 212 W. 79th St. (between Broadway and Amsterdam Avenue.) 8:30 p.m. RSVP here or by calling (646) 303-4406. Obama for America & Barack Obama Democratic Club of Upper Manhattan Watch Party - Washington Heights. Join the Barack Obama Democratic Club and Obama for America at Upper Manhattan hotspot Buddha Beer Bar. 4476 Broadway (at 191st Street). Arrive before 9 p.m. for conversation and a pint. Add some fiery food to the heated barbs at the Creole Restaurant & Music Supper Club, which will be hosting a watch party along with Organizing for America Team Harlem and the Progressive Democratic Club of East Harlem. The debate will be shown on two screens with a special selection of cocktails and appetizers, including Creole's "Voodoo Wings” and an "Obama-Tini." 2167 Third Ave. (corner of East 116th Street). 7:30 p.m.
Freda's Caribbean and Soul Cuisine will be serving up soul food and Caribbean dishes along with the debate, which will be broadcast on their television. Also on the menu: a special debate-night rum punch. 993 Columbus Avenue (at West 109th Street). 8 p.m. The Pine Box Rock Shop will be debate central through November, with different events planned for each debate night. Stop by Wednesday for a locally-themed raffle and drink specials, as well their usual 16 drafts, empanadas from V-Spot and other vegan-friendly bar snacks. Future events will include games of boozy, debate-themed bingo, all-night happy hours and a champagne party on Election Night. 12 Grattan Street. All funds raised will benefit Obama for America. Known for its trivia nights, the Black Rabbit will be hosting its very own debate watch party, with sound on all of its TVs, as well as live, comedic commentary, quizzes and prizes. 91 Greenpoint Avenue (between Manhattan and Franklin avenues). 8:30pm. Bruckner Bar and Grill will be hosting its own watch party. 1 Bruckner Blvd. 8:30 p.m.
Watch the debate close to home with Arabs for Obama at Dandana in Astoria, which will be broadcasting the debate while serving authentic Egyptian food. 42-21 Broadway, Astoria. 8 p.m.
Head over to the 37th Road “Diversity Plaza” for an outdoor watch party hosted by City Councilman Daniel Dromm, the New Visions Democratic Club and the Lesbian Gay Democratic Club of Queens. The debate will be projected onto a large, outdoor screen. 37th Road (between 73rd and 74th streets), Jackson Heights. 9 p.m. RSVP here. Billed as “the biggest debate party in NYC,” the NYC Liberty Republicans are inviting political fans of all stripes to catch the debate fireworks while celebrating the grand re-opening of 178 Mott Street, known as Tea Party Headquarters. There'll be food and drinks as well as drinking games, debate bingo, and a 50/50 raffle, according to organizers. “Whomever you are supporting — or not — it is sure to be one helluva debate watch in NYC," they said. 178 Mott Street. Ribbon-cutting at 7:30 p.m. Doors at 8 p.m. for drinks and networking. The New York Young Republican Club's monthly social just happens to fall on debate night. Meet them at SideBAR near Union Square for a free appetizer happy hour until 8 p.m. and $3 Bud Light drafts and 2-for-1 cocktails the rest of the night. 120 E. 15th St. (between Park Avenue South and Irving Place). 7 p.m. RSVP to rsvp@nyyrc.com. Join the Metropolitain Republic Club at their Upper East Side headquarters for a more sophisticated debate viewing. Light food and drinks will be served. 122 E. 83rd St. (between Lexington and Park avenues). $15 for members and guests. 9 p.m. RSVP to mail@metclubnyc.org or (212) 288-8606.